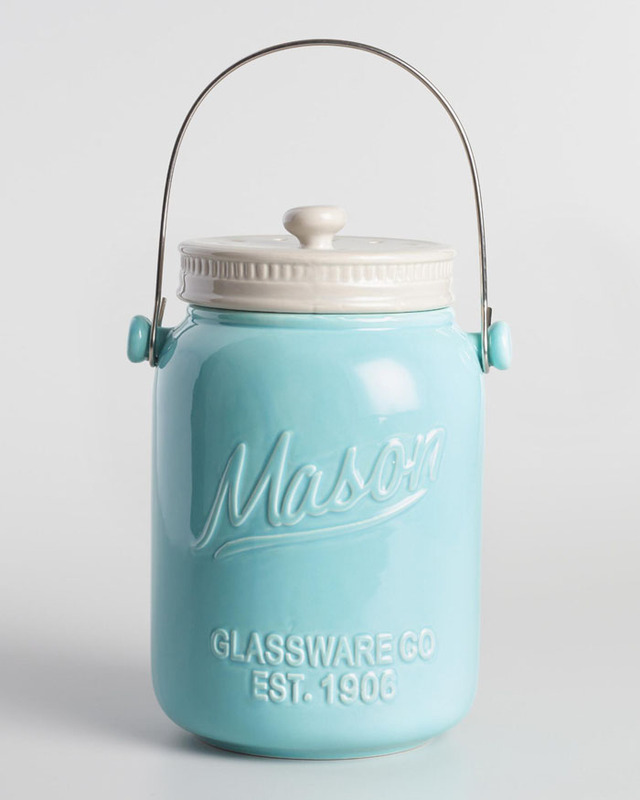 This Mason Jar Kitchen Canister Set was designed to evoke the look and feeling of times past. It’s not just functional storage, but the beautiful glaze is a focal piece and eye-catching addition to your kitchen. Ceramic lids feature a silicone seal to help lock in freshness. Set of 3. $39.99. Free shipping. Buy here. 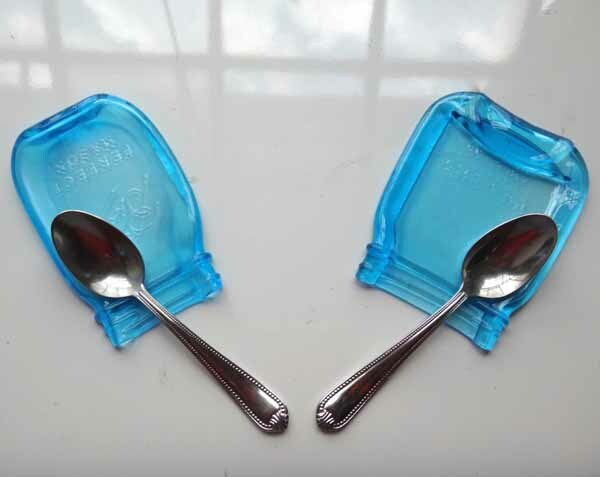 Add a splash of color to your kitchen with this Set of 2 Vintage Ball Mason Jar Spoon Rests! Perfect for using as a spoon rest, soap dish, butter dish or coaster. A limited edition 100th Anniversary Heritage Collection jar by Ball has been kiln fired for 12 hours, taking the beautiful blue glass and reforming it to new purpose. $24.99. Buy here. 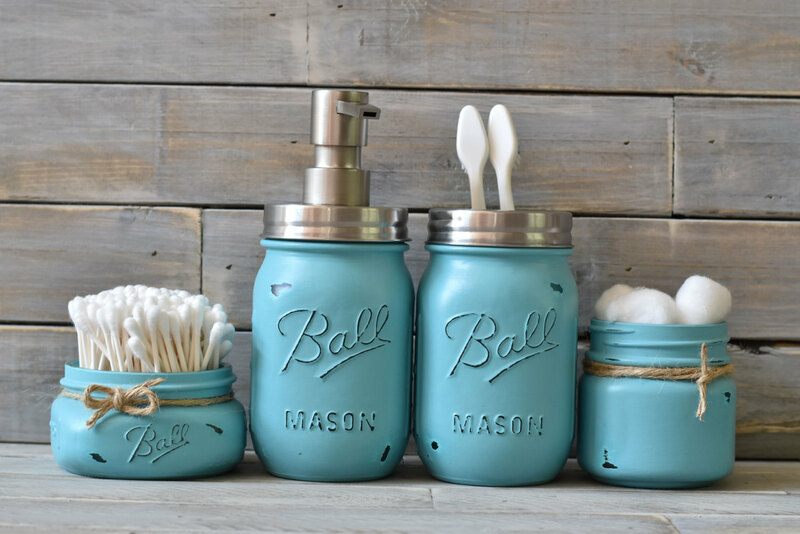 Decorate your bathroom with this beautiful Turquoise Mason Jar Bathroom Set! Includes soap dispenser, tooth brush holder, cotton ball holder and q-tip holder. Hand painted and lightly distressed for a rustic chic look. $40. Buy here. 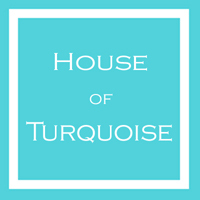 This Turquoise Retro Salt and Pepper Shaker set features a gorgeous see-through turquoise hue. Heavy duty glass construction. Their larger size makes a colorful statement on the counter. Measures 4.5″ tall. $17.95. Buy here. Crafted of ceramic with a vintage-style embossed design, this airtight Blue Mason Jar Ceramic Compost Bin looks great anywhere in the kitchen. It includes a replaceable charcoal filter that contains odors naturally and a swing handle for easy transport. $19.99 Sale $15.99. Buy here. 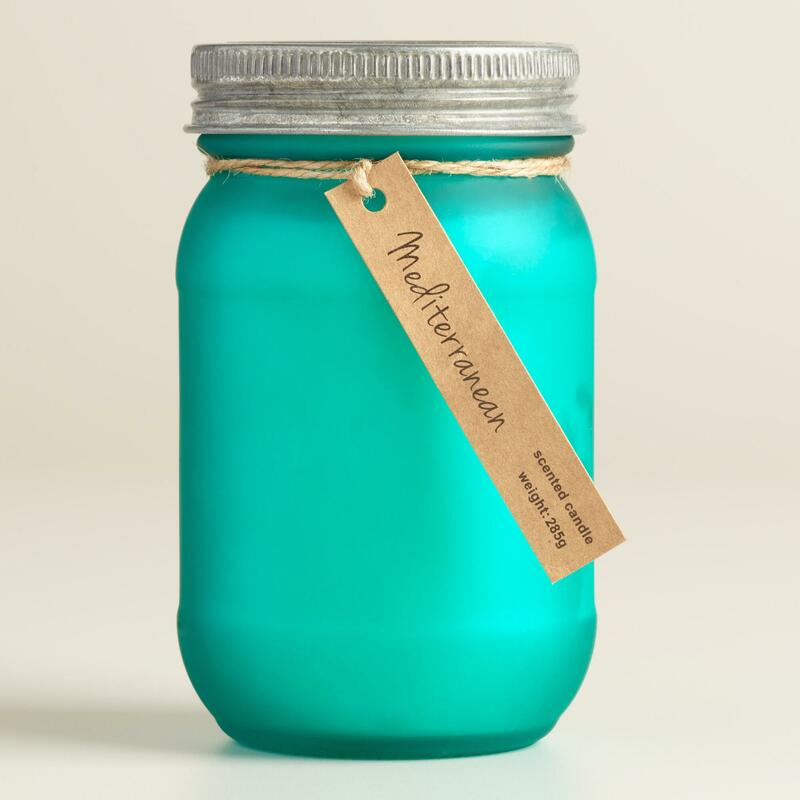 Keep mosquitoes away in style with this Turquoise Citronella Mason Jar. 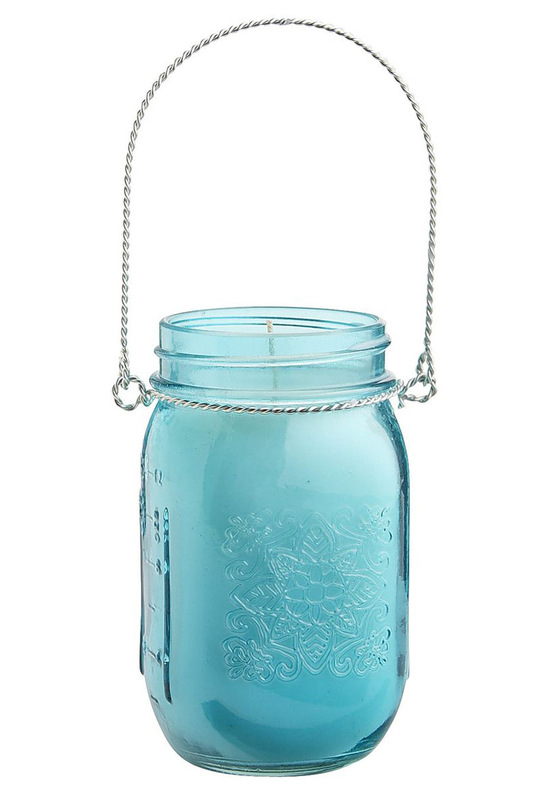 The attractive citronella candle comes in a traditional Mason jarâ€”so pretty, so practical. $12.95. Buy here. 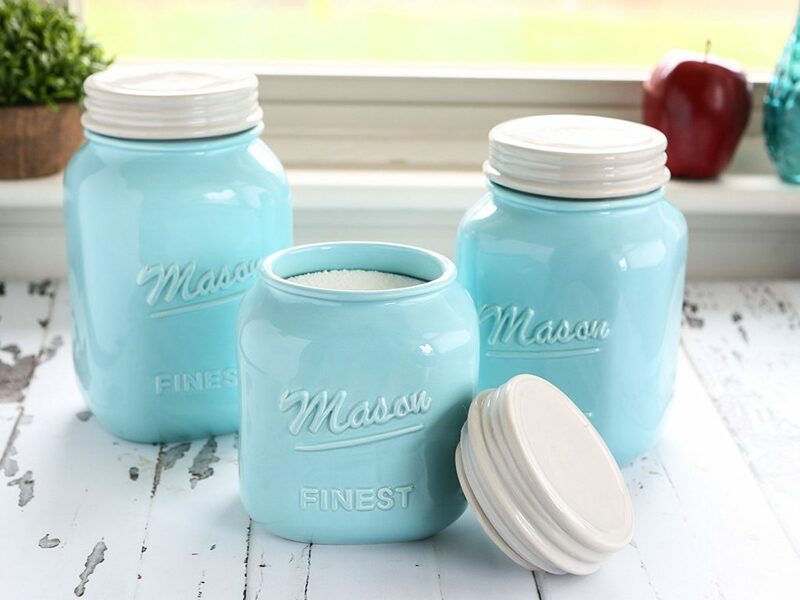 A bright, colorful twist on retro mason jar decor, this hand-pouredÂ Turquoise Frosted Mason Mediterranean Candle features a galvanized lid and brings the scent of the sea to your kitchen or anywhere in the home. $12.99. Buy here. 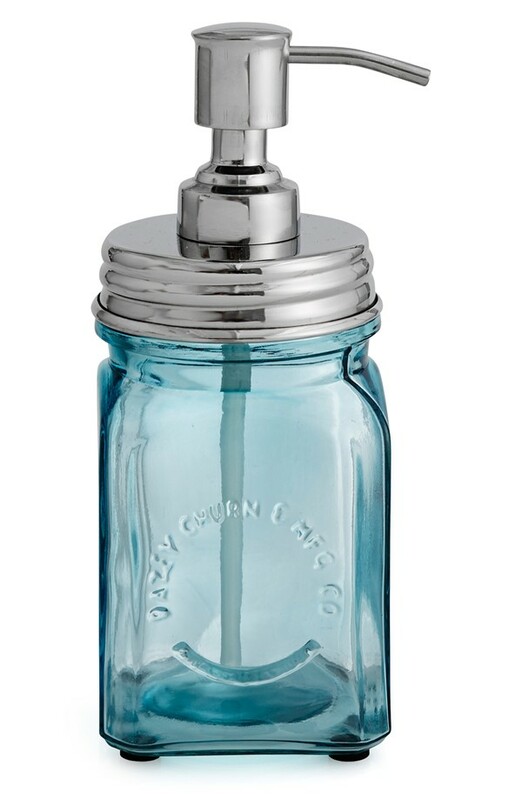 This mason jar-inspiredÂ Retro Lotion Dispenser provides a charmingly vintage addition to any bathroom dÃ©cor. $29.99 Sale $23.90. Free shipping. Buy here. 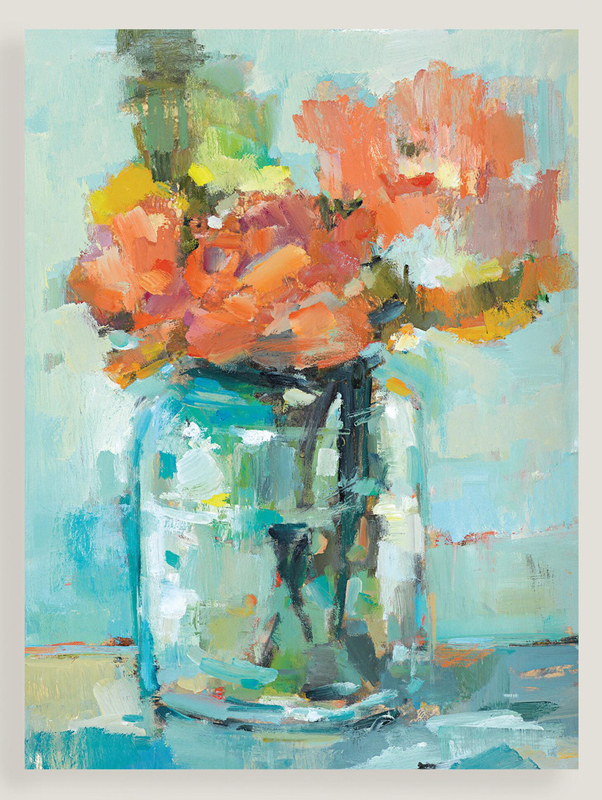 Bright coral-colored flowers lend a lively touch to the cool blue-green jar that contains them in this fresh, charming Mason Jar Flowers still life. Printed on stretched canvas. $129.99. Buy here. 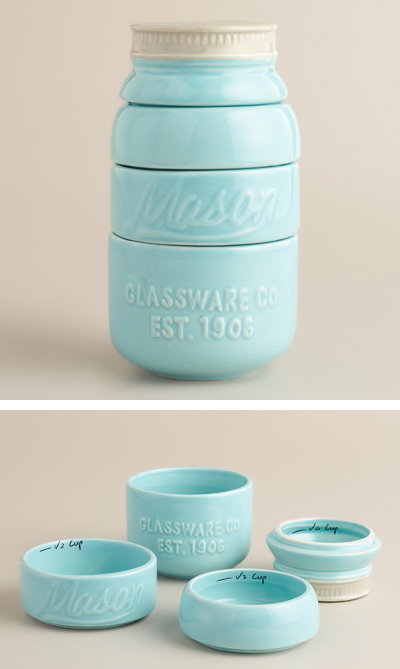 The stylish Mason Jar Measuring Cups feature a design inspired by vintage canning jars. 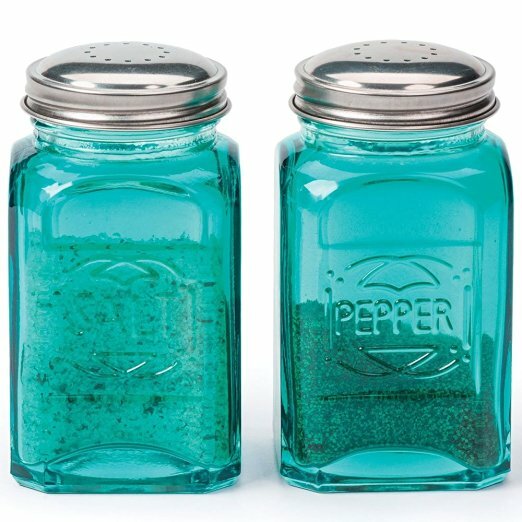 Use each layer of the jar to measure liquids or solids; after cleaning, stack the durable ceramic cups into an aqua blue mason jar for a cute countertop display. $12.99. Buy here. 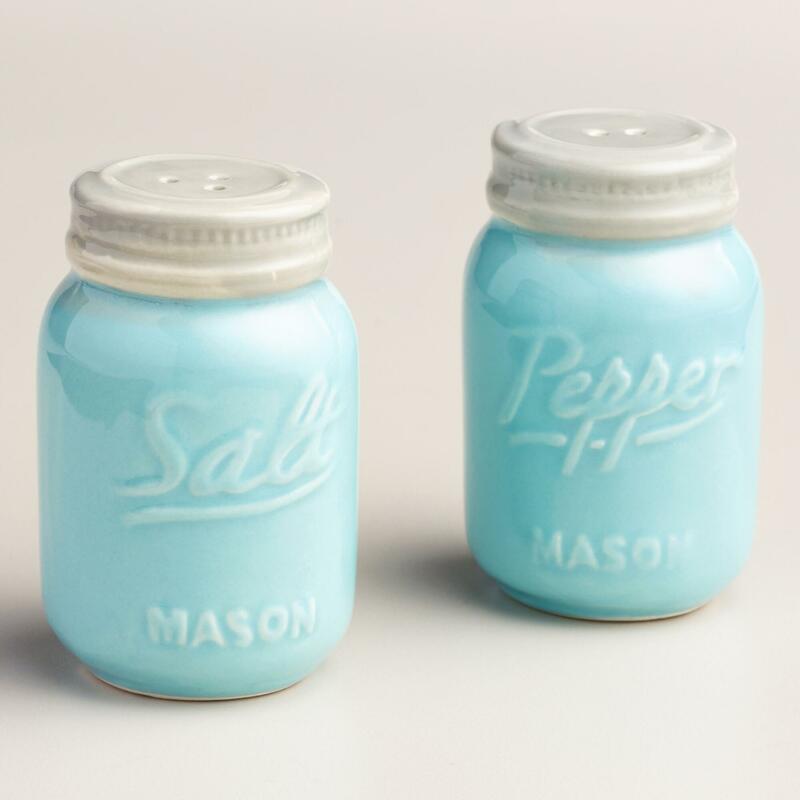 A great gift for collectors, this Blue Mason Jar Salt and Pepper Shaker adds a vintage-inspired look the to the tabletop. $9.99. Buy here. 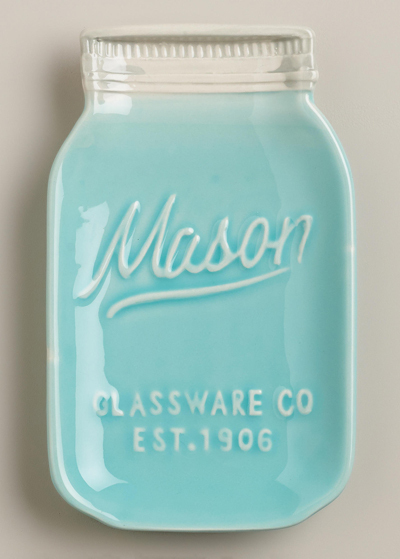 This embossed Mason Jar Ceramic Spoon Rest captures the look of vintage blue mason jars. Use this affordable accent to protect the counter from messy utensils. $5.99. Buy here. 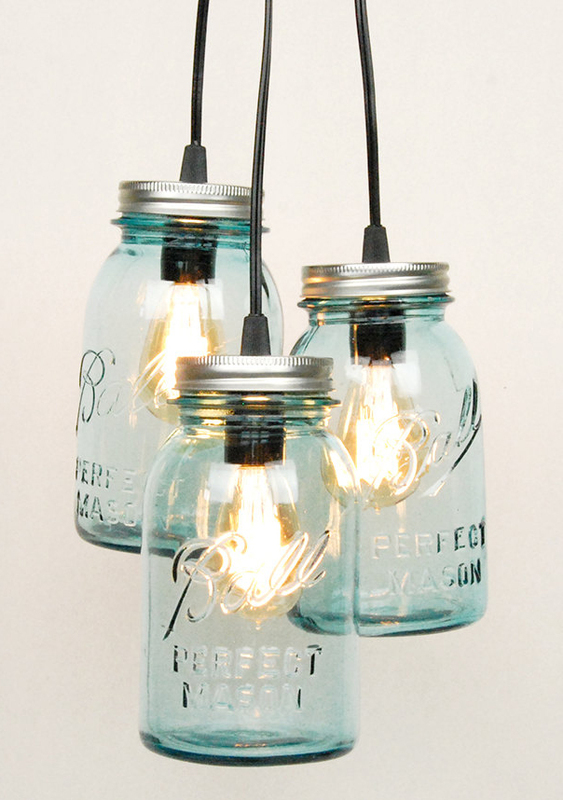 ThisÂ Mason Jar Chandelier features 3 vintage quart-sized mason jars and is the perfect way to light up your space in a stylish and affordable way. Each light has 10 feet of black or white cord with matching hardware that can be set at different heights for a tiered appearance. The jar lids have been designed with safety in mind with several holes that allow heat to escape so that the jars do not get too hot. $79.95. Buy here. 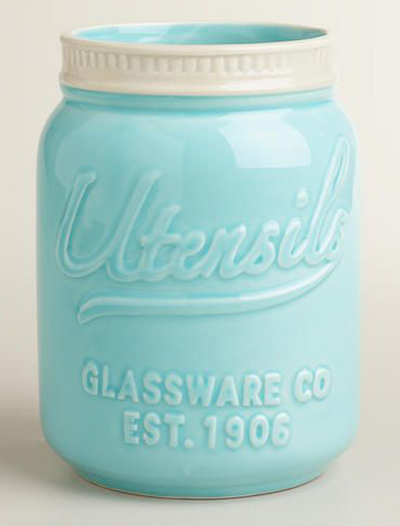 This chic Mason Jar Ceramic Utensil Crock captures the look of vintage blue mason jars. Use this affordable accent to keep your essential kitchen tools within easy reach. $9.99. Buy here. 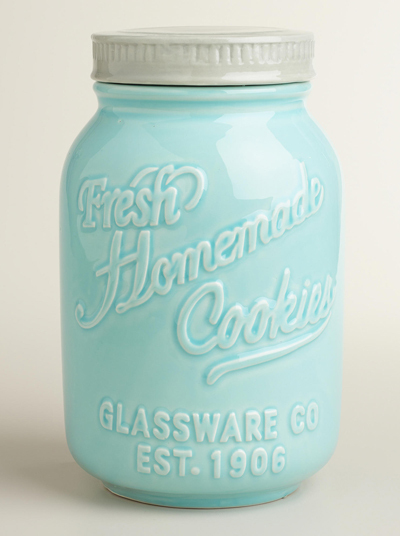 This retro-chic Mason Jar Ceramic Cookie Jar captures the look of vintage blue mason jars, complete with stylish embossing and an airtight lid. Use this affordable accent to keep your cookies and other baked treats fresh and ready to eat. $12.99. Buy here. 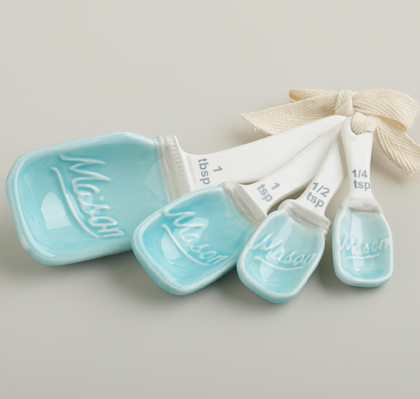 These Mason Jar Ceramic Measuring Spoons are embossed to capture the look of vintage blue mason jars. These chic measuring spoons are tied with cotton ribbon and nest for easy storage. $6.99. Buy here. 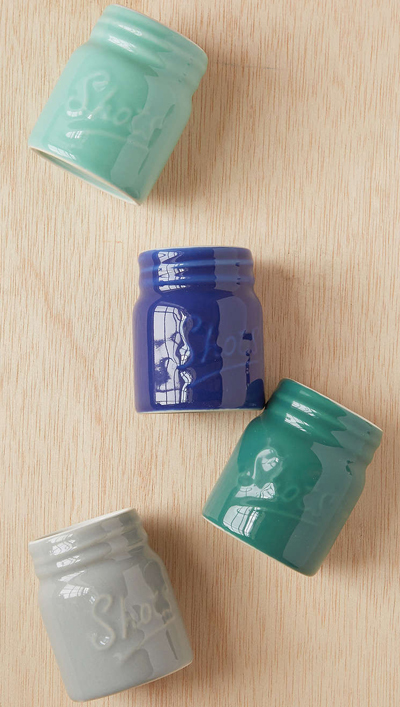 ThisÂ Tonal Mason Jar Shot Glass Set includes a set of four mini ceramic mason jar shot glasses – a fun addition to any bar or kitchen! $12. Buy here.